Monday started out as any other day. People were rolling in to the office slowly, trying to drag out as much of the weekend as they could. I was feeling particularly icky, dealing with a virus that had me down all weekend. But, things would soon be looking up! I ate lunch with one of my co-workers, Bob*, and while sitting in the cafe, I saw a man come in through a door at the back of the room. I asked Bob where that door went. He said it led to the old theater. Holy cheap seats Batman! In all our wanderings around the mall, the Brit and I had yet to uncover the old theater! Bob and I immediately ran back to the Annex to get the Brit and tell her of our find. Upon hearing about the discovery, we decided the only sensible thing to do was grab our cameras and go exploring! With a spring in our step and a twinkle in our eye, the 3 of us headed to the cafeteria and out the back door. What we walked in to was a small foyer with stairs on one side and a long hallway on the other. 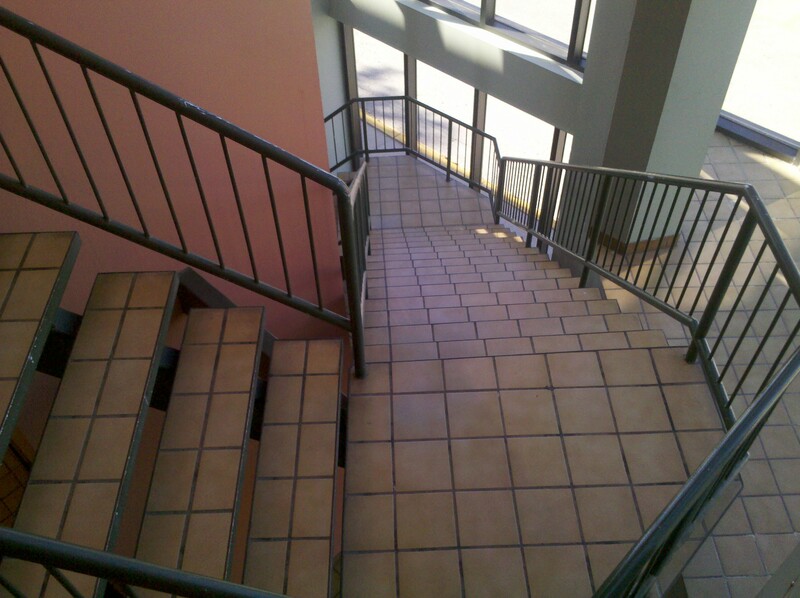 The stairs led down to the gym below and the hallway led to the theater. We turned right to go down the hall and were immediately stopped in our tracks by something so amazing that we were all rendered speechless. The scooter!! 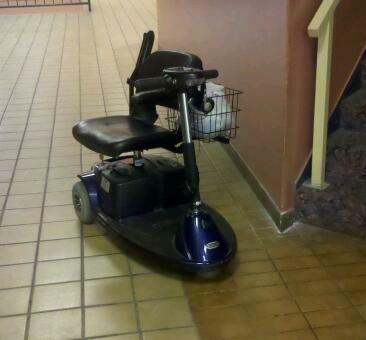 Yes, Scooter’s scooter was sitting in the hallway, abandoned. Where had he gone? Did Scooter really ever exist or was the scooter haunted? We didn’t stick around to find out. We continued on and came to the theater, which is now a Mexican church. All this time, the bay across from the Annex that we thought was the church was really just their administrative offices. This was their actual worship space. Except, it was run down and grimy and dusty. Very Alfred Hitchcock. The front of the theater. 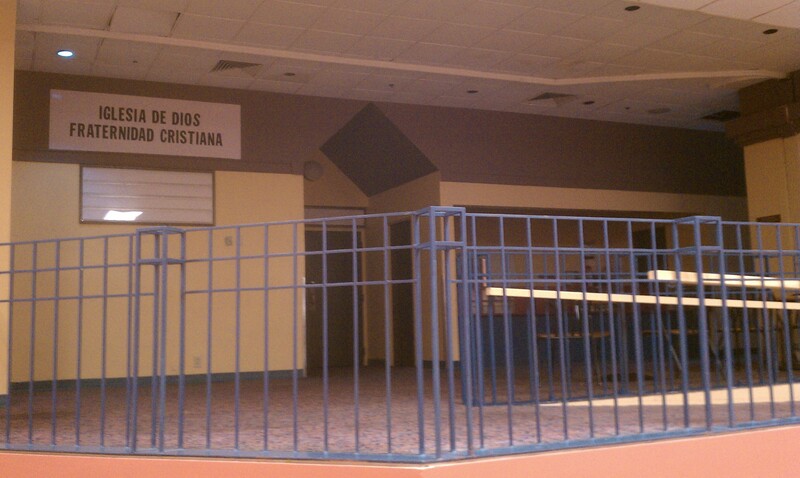 You can see the sign up in the corner which reads "Iglesia de Dios Fraternidad Cristiana"
I decided to be brave and go up there, where I found the old popcorn counter. 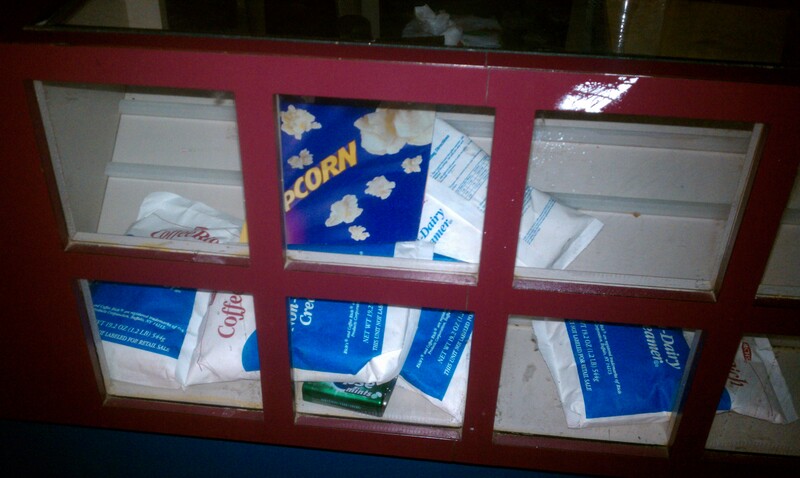 And it still had bags of popcorn kernels and coffee beans in the display case! I walked behind the counter and it was very dirty and scary and I was literally watching my steps, afraid I would step on a roach or mouse or something even more sinister. The Brit snapped a quick pic and then I was outta there! 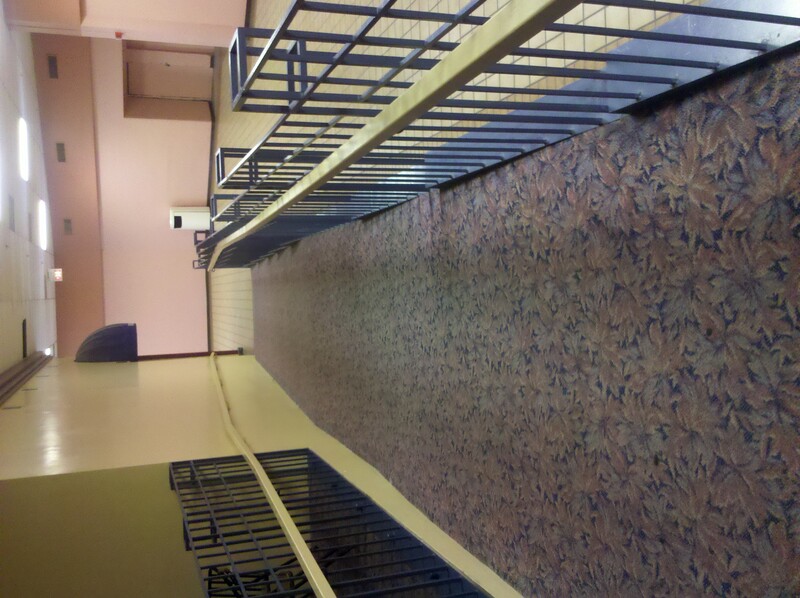 We followed the ramp which leads down to the ticket office (don’t you love the Pepto Bismol pink walls?). We then turned the corner and found the other side of the Theater/Church on our left and another set of stairs straight ahead. On the side of the church was an emblem. The emblem is a big circle with several bible verse references around the outer edge. In the center is Davinci’s drawing of David, with a church building strategically placed over his crotch. 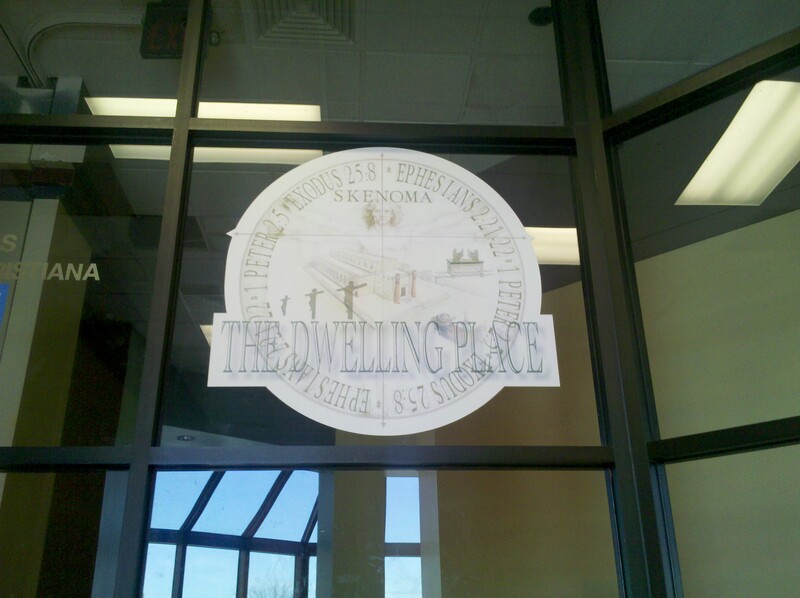 Then it says “THE DWELLING PLACE” in huge letters at the bottom. I’m sure it’s very meaningful to this church, but we just found it kind of strange…almost cult like. At that point we figured it was time to go back. So we headed the way we came – past the ceiling vent with black mold growing on it, past the old rickety door that is still locked even though it’s so barely on its hinges that even I could break it down with just a strong sneeze, past the “blood stained” walls and back to the hallway that leads out of this dark, desolate place. The very hallway where we first encountered Scooter’s scooter. We had been wandering and exploring for nearly 10 minutes by this point and we thought surely the scooter would be gone. It was still sitting there all alone, just as we had left it. We all just stopped and stared at it. Bob said that maybe we should call someone. The Brit thought we should get out of there before he came back. Just as she said that we heard a flush and we all screamed like little girls and went running down the hallway, practically diving back in to the cafeteria. 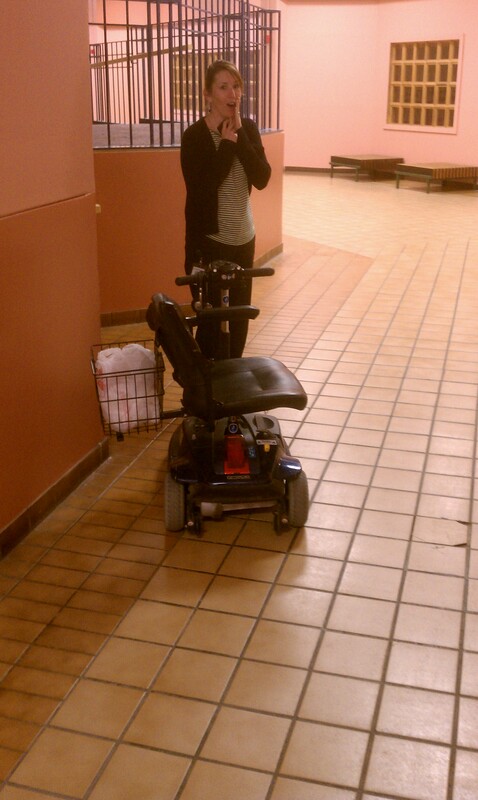 We didn’t slow down until we were safely back in the Annex. Not but an hour later, I would find myself unconscious on the bathroom floor. Coincidence? You tell me. Could it have been something I encountered in the Haunted Hallway? Was it from breathing in the harmful toxins that surely pollute the air back there? We will never know. Due to the unfortunate circumstances of Monday afternoon, I was out of work and unable to spend anymore time in the Annex this week. However, the Brit alerted me to the fact that on Tuesday afternoon, a water main broke in the area and all water to the building was shut down. It just keeps getting better and better! I can’t make this stuff up people! Thanks for tuning! 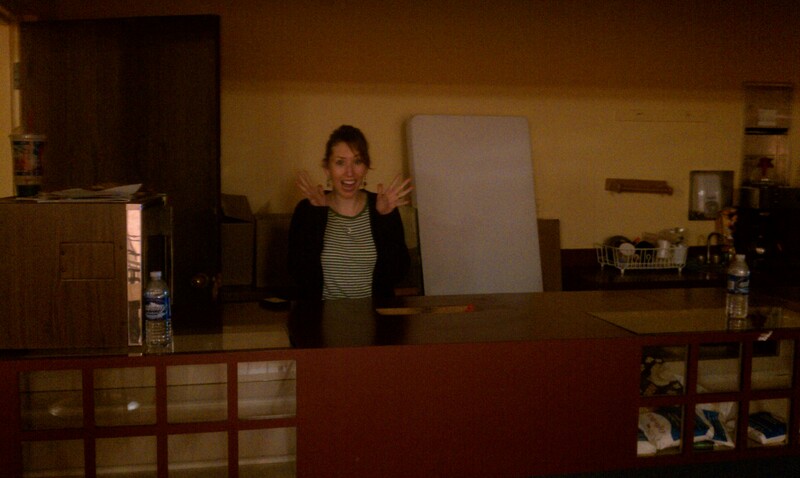 Until next week, consider yourself, Annexed! !